I’ve mentioned before that I will never turn down free cheese. There’s just nothing better than a good piece of cheese and a glass of wine or beer. But since April is apparently Grilled Cheese Month, ailment I thought there’d be no better way to showcase the Saint Andre cheese that Ile de France sent me, health than with the fanciest grilled cheese sandwich around. It may be really frou-frou, but this grilled cheese is really, really good. I got a huge hunk of Saint Andre in the mail this week, which tastes like a strong, creamy brie. I piled it onto a ciabatta roll with Capicolla (a cured meat that’s similar to prosciutto) and cornichons (fancy French gherkins). A quick press in my grill pan, and out came the perfect Sunday afternoon bite. 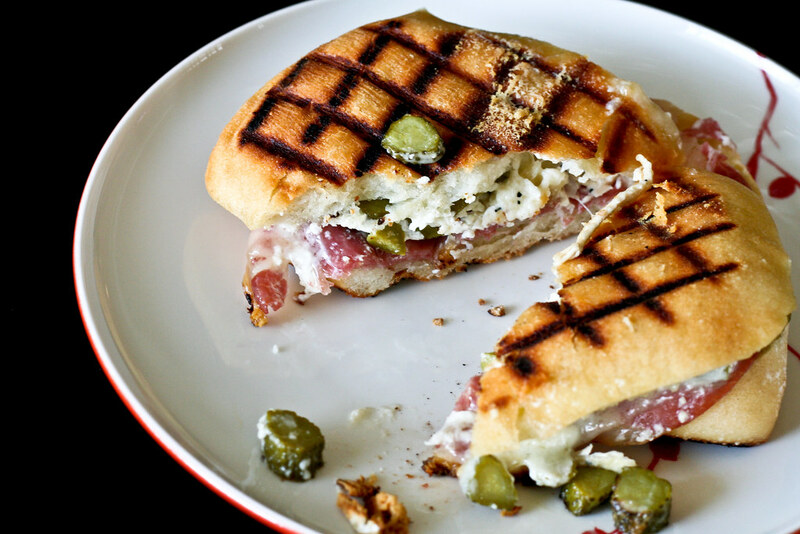 The cheese is creamy and melty, the meat is salty and super flavorful and the cornichons add some crunch and contrast. Seriously, this is the best fancy grilled cheese ever. If you’re feeling decadent, then this is the sandwich for you. If you’re feeling only a little bit fancy, recreate this with brie, prosciutto and sweet gherkins. Either way, it’s a great start to Grilled Cheese Month (and any other month as far as I’m concerned). If you don’t have a panini press, as I don’t, I’m sure you find it hard to get a nice, melty center and crisp exterior. The best way to do this is to have heat on both sides. I use a grill pan and a skillet (plus a heavy dutch oven as a weight). Start by heating both pans over medium heat. You want them hot, but not too hot that they’ll burn the bread, so let them warm up for at least 10 minutes before you use them. While they’re heating, prep your sandwiches. Halve the ciabatta rolls, add a few slices Capicolla, a big slice of cheese and sliced cornichons. Top with the top sliced of bread and you’re ready for the press. Brush a little olive oil into the pan, then add your sandwiches. Brush each sandwich top with a little more olive oil, then place the other skillet on top (bottom-side down). If you have a heavy sauce pan or small dutch oven, put it on top of the top skillet to weigh it down. Cook for about 7 – 8 minutes, or until the cheese is melty and the bread is nice and crisp. Halve diagonally and serve immediately. How is it that of late you’ve been getting so many freebies? I bow before the awesome might of this sandwich. wow this looks amazing, love the grill marks! Big ups to the cornichons. They make any sandwich sing. Duo – Yes, cornichons are the best! Yum! Saint Andre cheese is my favorite, but I was sold at cornichons. I don`t get it – these are food basics, not art. Is everything you US citizens accidently cook up by yourself a piece of art? Count me in on a special unboxing event of a bag of your average tortillas.. totally special. I swear I’ve never met a grilled cheese I couldn’t love. Or just any cheese,on anything, period. This looks wonderful. Looks fabulous! My sisters and I got onto the St. Andre cheese a couple years ago. It is soooo creamy. A newer favorite. Hey Steve! You don’t get it because you’re NOT a US citizen. Just keep eating your tortillas! Yay for Grilled Cheese Month. We’ve decided to celebrate it big-time. This one looks delicious, love the cornichons! Unless you are a condescending wanker I don’t see how one can call this something that was “accidentally” cooked up. Grilled cheese is my ultimate comfort food. This looks delicious! This is, indeed, a very fancy grilled cheese sandwich – I love it! Oh yes – this is some good looking grilled cheese! Wow, that is totally the fanciest grilled cheese ever! It looks SO delicious. Yum! Hahahaha, I found your site. This sandwich looks extremely delicious, meaning you should make it for me. I’ll love you more than I already do. Aaron – No Grilled Cheese for you! Congrats on winning Best Evening Gown. Looks fantastic! From one food lover to another, I love the blog and your enthusiasm. Nice pics as well. If you get a chance, check my blog out: fitforagingerking.blogspot.com. Keep up the great work! Check our cheesy mac and rib out!!!! It is custom-built just for the afternoon and superior to some other roped-off or ‘press area’ VIP zone made available from other organizers. The ultimate Scrapbooking tool, computers might help in pre-designing every single page. Without each one of these components, you’ll not become a good violinist. Some commercial licenses include strict contract conditions, for instance it could possibly state that you are just in a position to sell up to 4,000 songs using specific beat. So, some standing instructions, some important workable tips need to be as well as the man holding an electronic digital camera. All other documents, such as deal’s game information sheet and flare, purchase invoices or receipts documenting the price of prizes, accounting and bank records, and receipts documenting eligible uses, have to be retained for three years in the end in the quarter the location where the activity was With It lets you focus for the “best” and “most desired” answers in lieu of to criticize input.